Nowadays streaming music can be found everywhere, no matter if you are at home or on the road. Researchers from FOKUS developed smart processes for streaming and caching music in the car. One the one hand, their idea enables the joy of listening to music seamlessly. On the other hand, it treats the capacity of mobile phone networks with great care. Spotify, Deezer, Apple Music, Google Play Music – streaming music can be done wherever you like either at home or on the road. 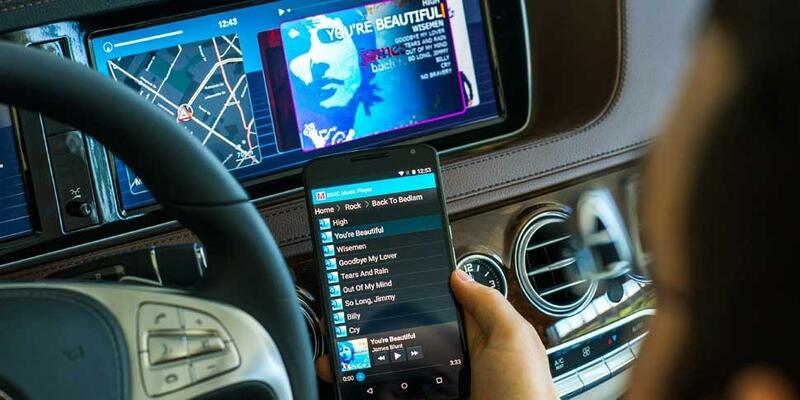 Many manufacturers already integrated music streaming services into their car. For instance, Volvo and Ford collaborate with Spotify and Mini cooperates with Deezer. But from the technical perspective, streaming in cars is a challenge due to poor mobile phone reception. For example, when the car enters a tunnel, streaming music ends immediately. Likewise when the car passes by rural areas with a low Internet reception or is traveling with high speed. Moreover, the bandwidth of the mobile phone network does not suffice to satisfy all the streaming clients and the music gets sometimes interrupted, especially during traffic jams. Therefore, scientists from FOKUS develop smart processes for streaming and caching music in the car. One the one hand, their idea enables the joy of listening to music seamlessly. On the other hand, it treats the capacity of mobile phone networks with great care. When the driver enters the car while listening to a song on his smartphone, his digital ID connects with the center console in the car. The car’s entertainment system continues to play the song from the smartphone. Due to this connection, the driver can access his own personal music library which can consist of different sources i.e. music streaming services or personal mp3 collections in the cloud. In this case, the car directly gets the music from the cloud which saves the smartphone’s energy. According to the destination the driver enters into the navigation system, the streaming adapts to the particularities of the route. Depending on its length and special characteristics as traffic jams or tunnels, the streaming alters the cache size. For example, when the trip is relatively short not all of the songs from a playlist are being downloaded. In addition, Fraunhofer FOKUS’ smart audio software for streaming and caching takes the current traffic conditions into account in order to estimate when the car is going to be right ahead of a tunnel. With this information, the song which is going to be played in the tunnel can be transmitted beforehand instead of loading it last-minute as it is done in areas of good reception. This so called “prefetching” leads to a permanent exploitation of the bandwidth and allows a seamless joy of listening to music. The technology considers the personal taste of music and works properly in both zones of low Internet reception and areas with a high usage of bandwidth. Due to streaming services, millions of music tracks are available at home and on the road. Via Internet connection, the demanded songs are temporarily transmitted to a smartphone or to the in-car entertainment system. The music will be played in high quality. Different from a download, the music tracks are not permanently saved in the car.